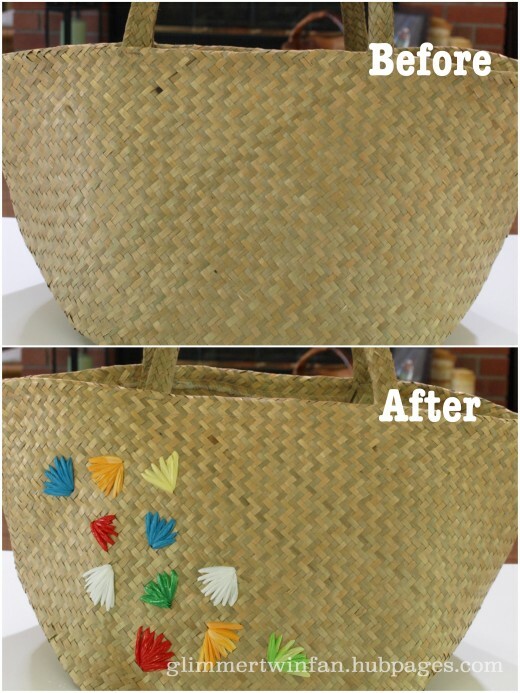 While perusing the aisles of a local thrift store a few months ago, I came across an old straw bag that had raffia flowers all over it. It was bright and colorful and was probably purchased during a tropical vacation someone took many years ago. I looked at that cute retro bag and thought that I could do something like that, maybe not as intricately and finely done, but definitely something like it. I had been stashing away brightly colored plastic bags that were just screaming out for a craft project, and the idea for this tote bag lept into my mind. So with plastic bags, a cheap straw tote bag and some basic supplies in hand, I went to work. The result is this fun and colorful straw tote bag. 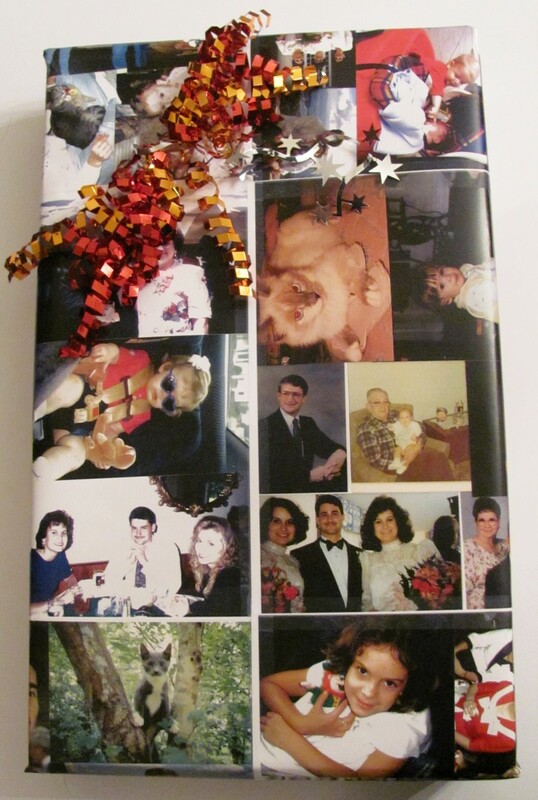 It only took about two hours to make and that was with all of the pictures I took. 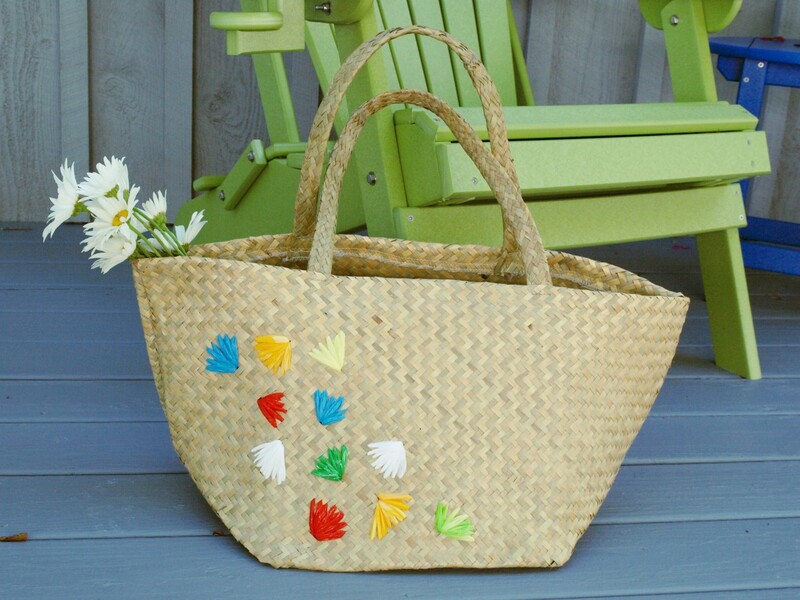 If you have a straw bag just begging to be spruced up, try this craft. You get a darling bag and, by recycling, you do a little bit of good for the environment. Here's how to make your very own bag. 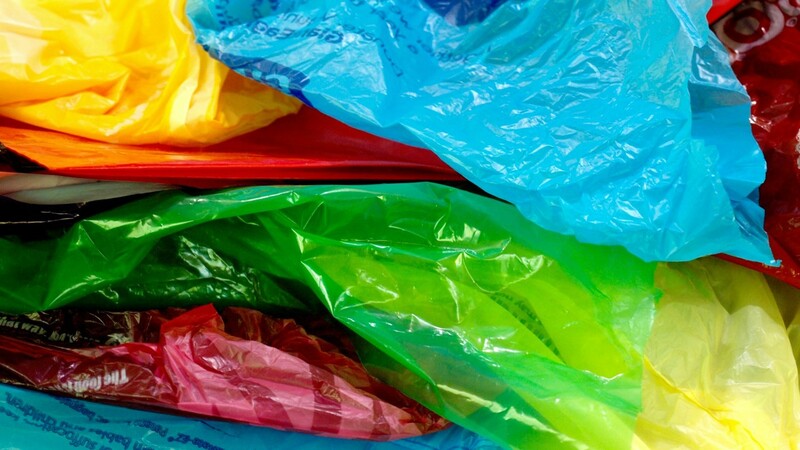 Plastic bags in various colors - I suggest using the ones that are thin and almost feel like tissue paper. The thicker bags are harder to sew with. Here's a great straw bag that would work well with this project. 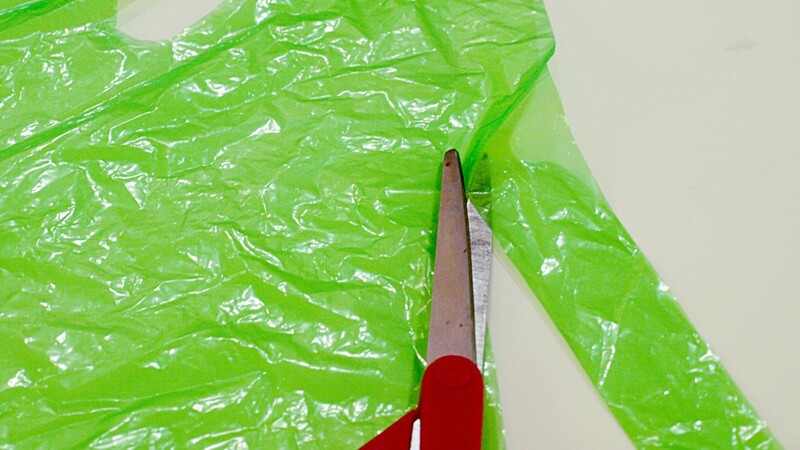 When cutting strips of plastic, I like to cut the bag along the seam and flatten it out. Then I cut strips, approximately 1" wide on the diagonal. I get a longer piece to sew with this way. The strips don't need to be perfectly straight or exactly 1". 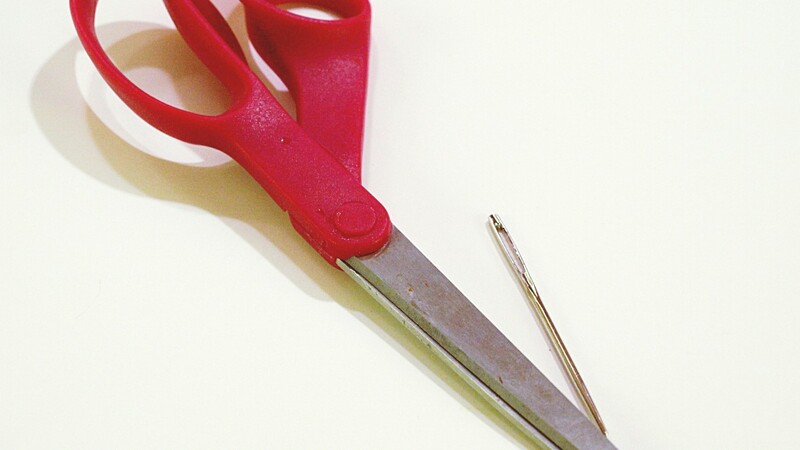 When sewn, they wrinkle up and no one can see the cutting line. To thread the needle, tie a knot at one end of the strip of plastic. Gently coax the other end through the eye of the needle. It's easier if you fold the strip in half, lengthwise. 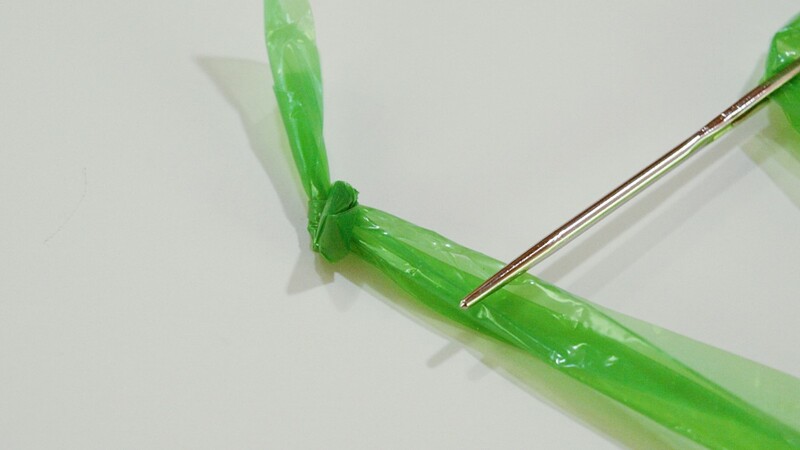 If it is still hard to thread the needle, try rolling the plastic in between your fingers to make it smaller. Once threaded, gently pull the plastic through. Now you are ready to sew! Here's the fun part...sewing the design on! 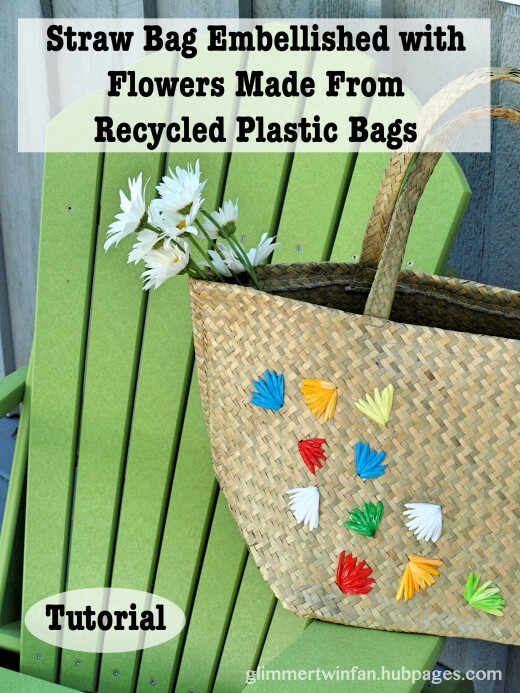 Decide what sort of flower or pattern you would like to add to the bag. You may want to sketch something out, or just freehand a design like I have shown here. I decided to go with this simple fan pattern. Beginning from the inside of the bag, find the starting point of your design and bring the needle through a gap in the woven straw. Pull through until it's stopped by the knot. It may take a few moments to find a good opening. Try not to go through the straw because it could break or fray it. 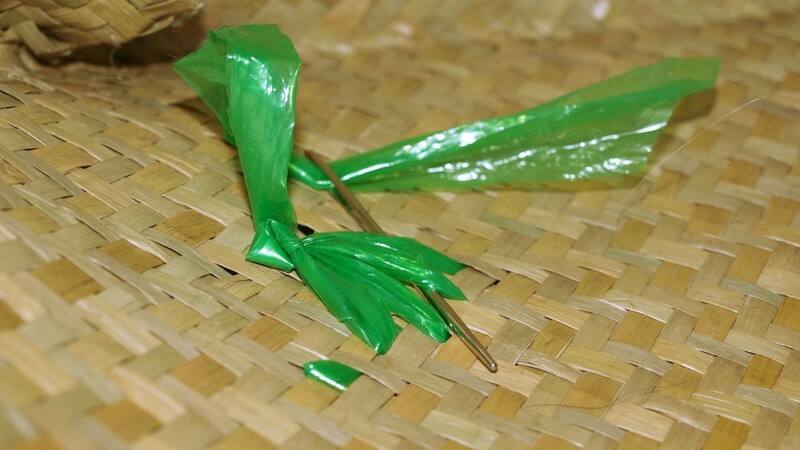 Decide where you want the pattern to go and insert the needle into the straw bag. Pull gently until tight. When you are pleased with your design, finish the sewing by inserting the needle through the outside of the bag into the inside and tie off inside the bag. To secure the sewn design, it needs to be done on the inside of the bag. Take your needle and feed it through some of the stitches. Then repeat, but this time, insert the point of the needle into the loop you just made. Pull tightly, but gently. This forms a secure knot. I've made a video tutorial showing how to sew the design onto the bag. It gives more detail on each step. That's all there is to it! 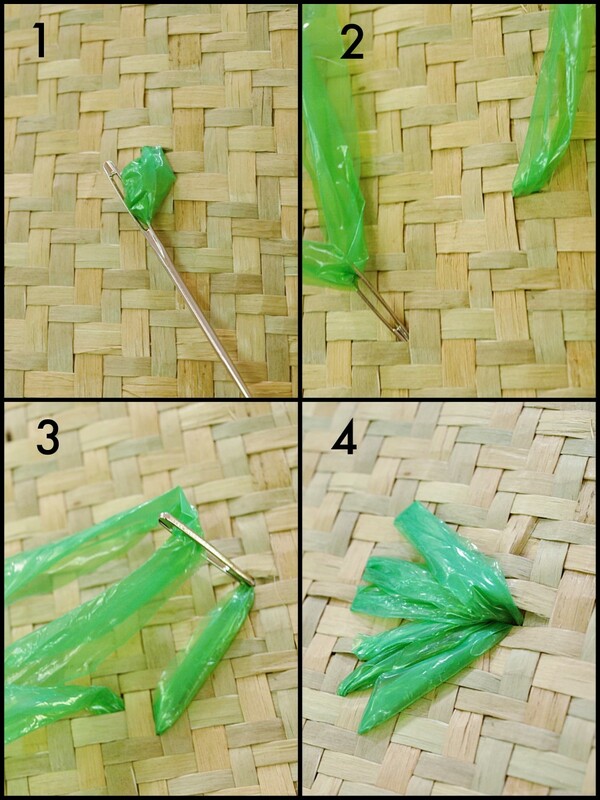 I love the way the straw bag is transformed with this method. The design gives it a little bit of a fun retro look and really brightens the bag up. It's perfect for your next trip to the store, beach, pool or just about anywhere else. 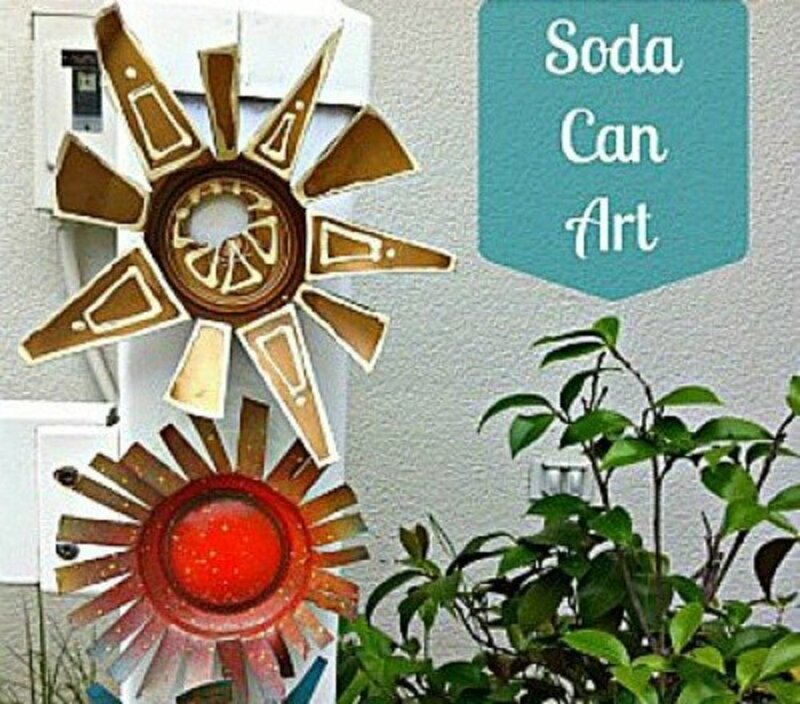 Do you try to recycle household items and use them in crafts? Great idea, I am sharing with my craft loving sister in law. I have seen mats made from the bags too.. wonder how they would translate to bags? Fun and useful article. Oh I love the idea of doing this on Easter bonnets!!!! That will be so much fun. Thanks for reading and commenting. So happy to have stumbked upon this. I know what I will be doing on my childrens easter bonnets next spring now. Thank you! Hi teaches - This one is easy to make, that's one reason I like it. The older I get, the more I like easy craft projects! Thanks for checking it out. Thanks Flourishanyway! - Those plastic bags drive me crazy, I get so many of them. At least this uses up some of them. Hi georgialgal1984 - I'm glad you enjoyed this project and that you don't think it looks like plastic bags! I was hoping people would think that. Thanks for commenting and enjoy the rest of your weekend. Wow - thanks aviannovice. I've often thought about selling online, but just don't have the time or patience to make enough inventory! Have a great day and thanks for the comments. What a pretty bag! I would not have thought to use plastic in this way. You make it seem to easy to make. 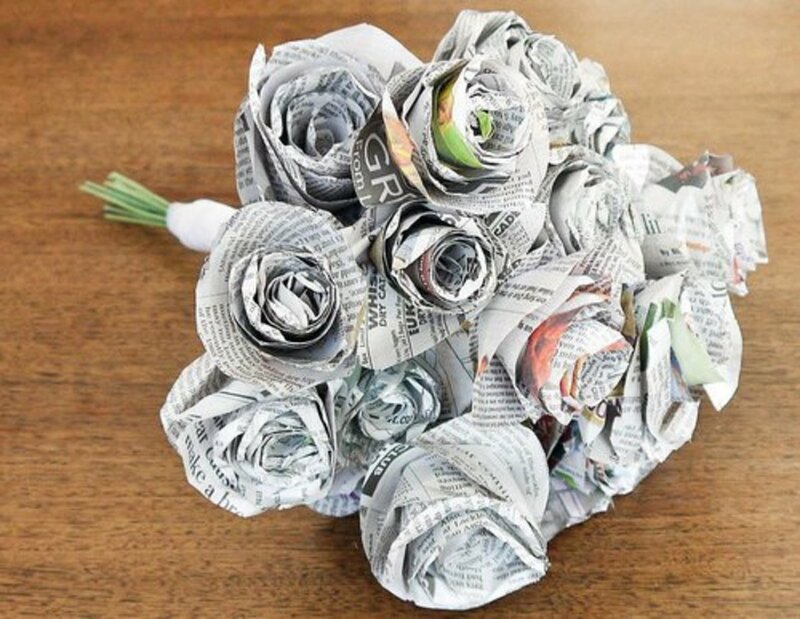 I like your use of recycled bags here -- so creative! You can really do incredible thing with nothing. 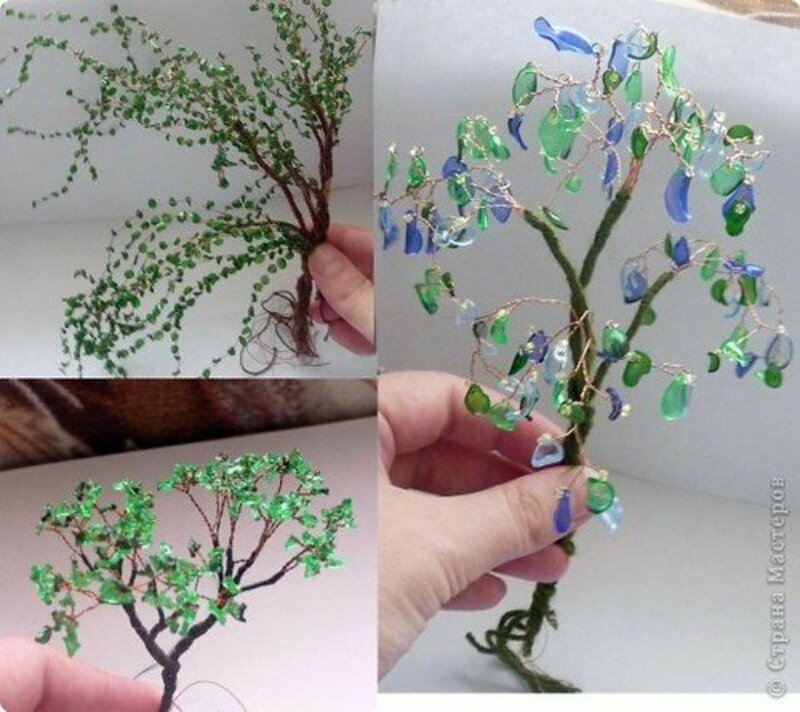 Bet you'd do quite well on Etsy. I have a friend that knits and sells her wares there. Hi Bill - Thanks so much. I actually took this little bag on a road trip last weekend. It came in handy. I've been a little quiet on the hub front, but now that my daughter is going back to school I may have more time to get creative again. Enjoy your weekend! Thank you KoffeeKlatch Gals - I really appreciate it. Hope you make one too if you like to crafts. Have a great weekend. I love this idea. Your tutorial is terrific. An absolutely awesome hub. Hi travmaj - So glad you enjoyed this article and I thank you for your nice comments. Hi AliciaC - Thanks for stopping by. I like doing fun projects like this that don't take too much time and add a little whimsey to something. This is totally creative - what a great idea and how well you have demonstrated it - thank you. The finished project looks very pretty, Glimmer. Decorating a straw bag is certainly a good way to reuse plastic bags. Thank you PAINTDRIPS, I'm glad you enjoyed it. It's a fun project. Hi sallybea - I have always been fascinated by those pretty raffia flower straw bags. Some of the old ones are quite valuable. This is a cheap way to get a look that is a little bit like that. Thanks for stopping by! 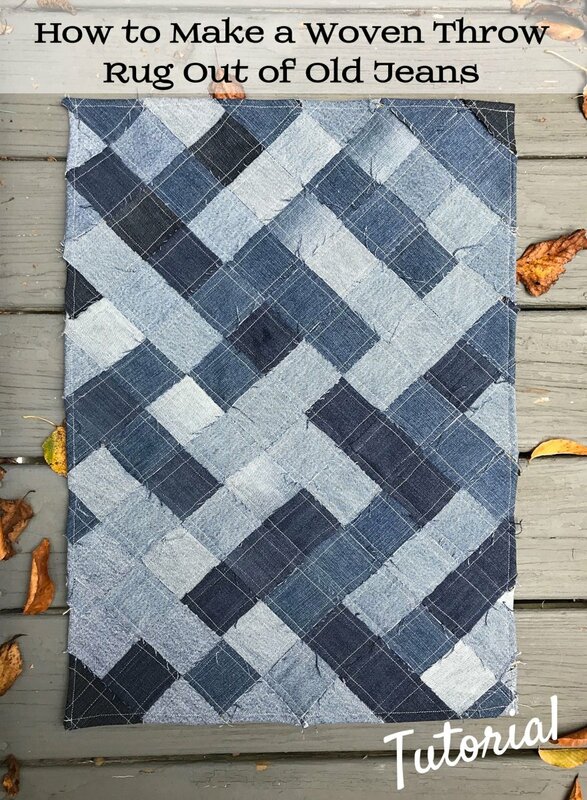 Lovely idea and easy to follow tutorial. Nicely done. That's a great idea. I remember bags similar to the one you modeled this Bag on. They were usually made with raffia as you say, but this is certainly a novel way of creating something different. Well done! 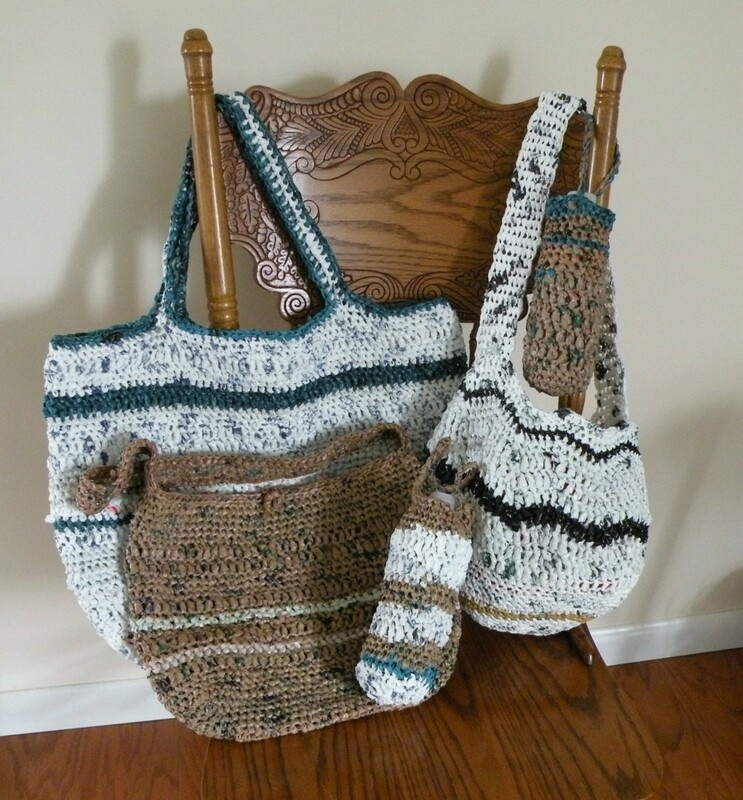 Thanks purl3agony - Some of those vintage straw bags are incredible. They have layered flowers and all sorts of fun designs. This one barely scratches the surface, but it's a fun project. Glad you liked it too. Thanks for all of the support!!! Have a great weekend! Hi Bill - I think the best advertisements for new things or projects is other people. I believe you wrote an article about finding inspiration around you. This one just jumped out at me! Have a great weekend too. Are you guys getting any rain yet? Wow! 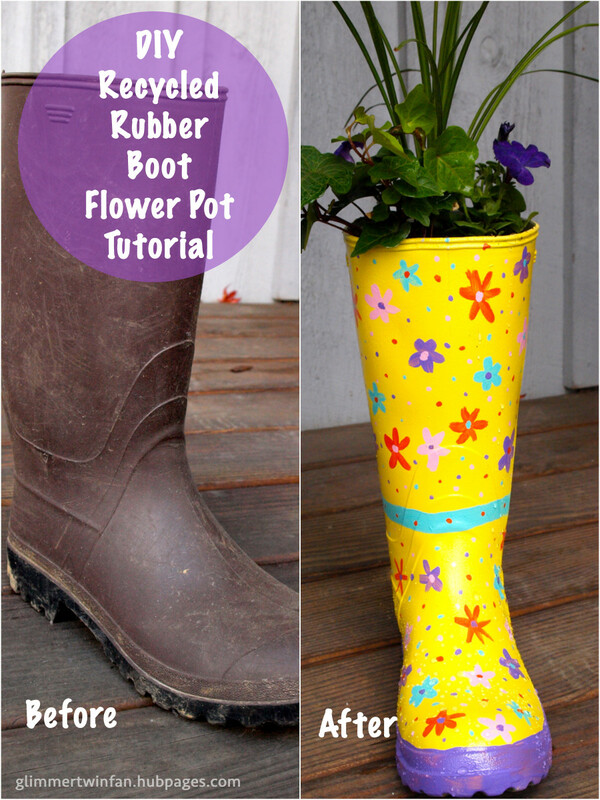 Love this idea and tutorial. I've always admired vintage straw bags that had flower details, but I never thought to just add my own. 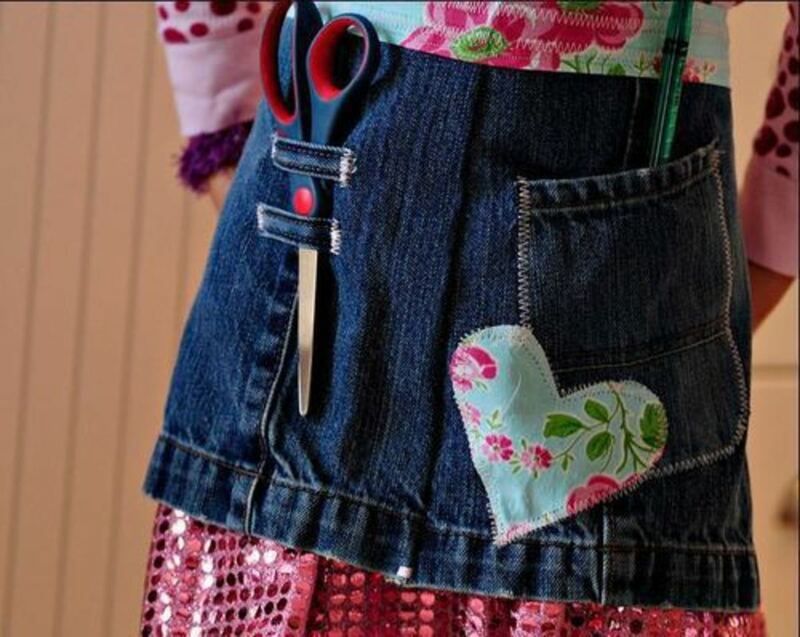 And of course, I love the thought of reusing plastic bags to add these colorful details. Your hub makes this all look so easy. Thanks for sharing. I always enjoy reading your hubs. Voted up, awesome, and pinned! That's how I decide upon projects in the yard. I'll drive by a home and see something, or I'll be in a store like Home Depot, and I'll tell Bev "I can make that." And I do, always using recycled materials. That's a long-winded way of saying I understand.